The National Police Gazette, November 10, 1894. Note: Due to the use of term association football during the late 19th century and the subsequent rise of the term soccer to refer to the same game thereafter, I use the terms football and soccer interchangeably within this article. Additionally, this is not a definitive biography of Dennis Shay. As more and more sources from the late 19th century are digitized and available online, a greater overall understanding of his career, and that of his peers, will certainly emerge. The lineage of American goalkeepers is a storied one. From Olaff to Borghi, Keller to Howard, the list of prolific American goalkeepers who have made their mark on the history of the game is a lengthy one. The goalkeeper position is truly the only position that America produces consistently that draws unquestionable respect and recognition internationally. As the U.S. Men’s National Team attempt to qualify for the 2018 World Cup, fans continue to speculate who will succeed Tim Howard and become the next great American goalkeeper. While fans debate and a number of keepers vie for the chance to become the next great American between the posts, it is worth looking back at a forgotten goalkeeper who may be considered the patriarch of America’s distinguished goalkeeping lineage, Dennis “Denny” Shay. Much like his noteworthy but overlooked footballing career, nearly all information relating to Dennis Shay’s early life is lost to history and forgotten. Even the date of his birth is not truly known, though the 1940 U.S. Census denotes Shay’s birth year as “around 1870.” Whether in 1869 or 1870, Dennis Shay was born in Hancock, Michigan to John Henry Shay and Mary Sullivan, Irish immigrants who would soon settle the family in Bristol County, Massachusetts. The family left the Upper Peninsula likely looking for greater economic fortune in the booming textile industry in towns like Fall River and New Bedford. The move eventually proved fortuitous for Dennis, as it was the family’s relocation to Massachusetts that exposed him to the game at a young age and provided him with an avenue to play the game at its highest level in the country. During the 1880s, when Denny was developing an affinity and knack for the game, the game grew in popularity throughout the Northeast. Mill towns throughout Massachusetts, burgeoning with British, Irish, and Scottish immigrants, spearheaded the growth in the game’s popularity. Citizens of these mill towns formed clubs at an incredible rate during the 1880s, Fall River alone housed over twelve clubs in 1886. To govern the growing multitude of clubs and leagues popping up across the Northeast, a group of British expatriates founded the American Football Association in 1884 and established the American Cup, the first national soccer championship in the United States, the following year. It was within this atmosphere that Shay found himself exposed to the game. Shay likely began playing the game with other children on the streets of Bristol County. By his teenage years, Shay’s talents proved worthy enough for a spot on the Oak Grove Rangers. The Rangers, described in 1894 by The Brooklyn Daily Eagle as “a sort of kindergarten club for the association clubs,” competed in a junior league, or second class league, a level below the Bristol County Football Association (BCFA), which housed Fall River clubs, the East Ends, Rovers, and Olympics, among others clubs from towns throughout Bristol County, Massachusetts. Statistics for the junior league are near nonexistent, however, Shay’s ability in goal must have been apparent to all of the senior league clubs because by the time he turned eighteen he was playing with arguably the best team in the county, the Fall River Rovers. Shay’s career cannot be discussed without mention of the Rovers. 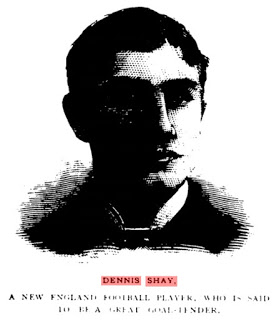 Without the Fall River club, Shay may never have achieved on-field success and become the first great American goalkeeper. By the time Shay suited up for the club in late 1887, or early 1888, the Rovers were American Cup Champions and considered one of the best teams in the country. Isaac Buckley, Thomas Buckley, Thomas Burke, and James Marsh founded the Rovers in February 1884. The men named the club the Chance Street Rovers after English club Blackburn Rovers with the intention of defeating Fall River’s best club, the East Ends. It did not take long for the newly formed Rovers to overcome the East Ends and rise to prominence within the city, as the club finished the 1884-85 season, their first in the (, as one of the best in Fall River. Prior to the start of the 1885-86 season, The Fall River Football Association became the Bristol County Football Association. The name of the league meant little to the rising juggernaut Rovers as the club became a force regionally, earning enough money to build their own ground by the fall of 1887. When the Rovers opened their ground on September 5, 1887, they were known as the Fall River Rovers, no doubt due to the club’s rising status regionally – Chance Street likely not carrying as much weight in towns across the region. Although the club was becoming one of the best in the area, winning the Bristol County Cup in 1885 and 1886, the club had yet to attain the status of the elite by capturing the American Cup. The 3-time American Cup champion, Clark Our New Thread (ONT) team was the true measuring stick of greatness during this time and all league titles paled in comparison to the nascent “national” American Cup title. Despite the troubles in readying the club’s grounds for the opening game of the season, the Rovers truly became one of the country’s premier clubs during the 1887-88 campaign. The club continued to show well in BCFA play, but the club, eying a bigger prize, opted to enter the American Cup – 1888 being the first year that New England teams entered the tournament – with the intention of becoming the best club in the country. Riding a string of blowout victories in the tournament, the Rovers entered the American Cup Final against Newark Almas with Mullen still in goal. The game took place on the grounds of Clark ONT in New Jersey on April 14, 1888. Taking place in NJ, the game appeared to be a home game for Almas, but, to the Rovers, the venue was irrelevant. The outcome of the game mirrored the results of the tournament’s previous rounds and ended with a Rovers 5-1 blowout victory over Almas. With the help of the telegraph, news of the victory spread quickly. The citizens of Fall River were ecstatic with the result. Some people called the day the Rovers won the title “the greatest day in the annals of football in Fall River.” Praise for the Rovers victory did not end there as the city hung two banners, one stating “Welcome home, champions of America.” In addition to the banners and a planned procession through the town, the city also held a dinner and concert in honor of the American Cup champions. The Fall River Daily Herald summed up the city’s excitement for the occasion best, “They have crowned themselves with glory in winning the championship of America, and well deserve the reception and illumination.” The club had attained the status of the elite. The signing of Shay signaled the club was intent on maintaining their class distinction for many years to come. It was during this period, following the quick ascension of the Rovers as the country’s best, that Shay became a fixture at the club. At just eighteen years old, Shay entered the first team of the Rovers. The young Oak Grove product did not immediately supplant Mullen in goal, but Shay did find first team minutes almost immediately after joining the club when he played center forward for the Rovers in an exhibition game against Boston Rovers just a few weeks before the Fall River club won the title. Ultimately, Shay’s days at forward did not last; he was starting between the posts by the start of the fall of 1888. Once firmly entrenched in the starting eleven, Shay did not look back. He became a permanent fixture between the posts for the Rovers for the next three years and cemented his reputation as one of, if not the best, goalkeeper in the nation by the time he left the club. Though still holding the BCFA league in high esteem, the Rovers, with Shay in goal, entered the 1888-89 season intent on repeating as national champions. In addition to Shay, the club brought in two players from Almas, Bernard “Barney” Fagan – Scottish Cup winner with Hibernian F.C. in 1886-87 – and Frank Cornell, to bolster the already strong side. The club, as it had for the past few years, continued to show well in the local league, but truly shined on the national stage with this influx of talent, easily maintaining their status as the country’s premier club. With Shay between the posts and the twenty-one-year-old veteran Fagan assuming the role of club captain, the Fall River Rovers made easy work of their opponents in the first two rounds of the 1888-89 edition of the American Cup. The club faced off against the Rhode Island champion Pawtucket Free Wanderers in the tournament’s third round. The match proved to be quite the affair. Shay and the Rovers journeyed to Pawtucket for the match. Throngs of people attempted to attend the highly anticipated matchup. According to The Fall River Daily Herald, “so dense was the gathering that tickets could not be supplied to those who wished to gain admittance before the game began, and the result was that the cheering of those inside the grounds so inspired those outside that they broke in the large double gate and went rushing into the ground without paying an entrance fee.” The Rovers routinely drew in fans by the thousands throughout this period no matter the competition. Using their superior tactics, the Rovers narrowly defeated the Rhode Island champions, 2-1, though the game was never in much doubt. The Rovers scored the first goal of the game just minutes after the opening whistle and the Fall River club never looked like losing, heading into halftime up 2-0. The Wanderers were able to score in the second period, but it was for naught as they conceded their first game at home to the defending champion Rovers. The Caledonians did not play the game of their lives. In fact, the Final, once again held on the Clark ONT grounds in New Jersey, proved to be another easy game for the best club in the country, the Rovers. On April 13, 1889, the Rovers easily won the 1888-89 American Cup Final 4-0. The result was another clean sheet for Shay and a second American Cup title for the Rovers. Over the course of the Rovers five games in the tournament, Shay only conceded one goal, and the club held a goal differential of 24 to 1. Fall River once again feted the national champions, welcoming the team home with fireworks and a brass band. The Rovers were repeat champions and unquestionably the best team in the country. Shortly after the American Cup victory, the Rovers were rumored to be making plans to sail to England to take on Aston Villa, Preston North End, and other English clubs. The England tour never quite got off the ground, but the Rovers were unquestionably the best team in the country and their young goalkeeper, Dennis Shay, was quickly cementing his place as the first great American goalkeeper. Shay continued to man the goal, with cameos as an outfield player, for the Rovers until the summer of 1891. By that time, Shay had established himself as one of the best, if not the best goalkeeper in the country, and his ability caught the eye of individuals associated with a planned Canadian soccer tour of the British Isles. Initially, the tour was intended to mimic an 1888 tour and be made up entirely of Canadian players from the Western Football Association, but complications arose with the tour’s plans and the tour’s management invited Shay and several other American players to participate in the tour. The tour ran from August 1891 to January 1892. The joint Canadian-American team competed in 58 games in just 135 days. Shay appeared in goal for 47 of those 58 games, playing in games against some of the best teams in England in Burnley and Preston North End. Although the tour is not looked at as a success historically – the Canadian-American team lost 30 of the 58 games – the tour was a positive experience for many of the players, including Shay. In fact, Shay’s ability in goal throughout the tour elicited praise from English newspapers despite the Canadian-American’s collective on-field performances. Shay’s play even saw him carried off the field after one match and merited the American goalkeeper several offers from English clubs. Shay, who said “he could have held his own against the goalies of Great Britain,” ultimately turned down the offers, and the chance to become the first non-British player to play in England’s Football League – that honor belongs to his Canadian teammate Walter Bowman – and returned to Fall River. Once back in the United States, Shay suited up for a team in Pawtucket, Rhode Island before returning to the Rovers in 1893, the same year that he married his wife, Catherine Neary. By that time, with the numerous championship medals he had earned and the British tour under his belt, Shay was widely considered the best in America at the goalkeeper position. When it came to soccer, newspapers across the Northeast, then the nexus of the American soccer world, were espousing praise of Shay’s exploits and proclaiming the young goalkeeper the best in the country at his position. Soon Shay would be one of the game’s greatest professionals, even if only for a very brief time. Soccer, like nearly all sports in America, was still an amateur affair in the early 1890s. Baseball provided America with the only professional sport in the country and dominated the summer months, but it wouldn’t be the only sport played professionally for long after the growing popularity of soccer, played during the winter months, caught the eye of baseball’s most entrepreneurial owners. Several baseball magnates saw the game as the perfect sport to fill their stadiums during baseball’s offseason. The way the baseball owners intended to do this was to make soccer a professional sport under their auspices, which is exactly what six National League owners did during the summer of 1894 when they created America’s first professional soccer league, The American League of Professional Football (ALPF). As early as February 1894, the owners of the Baltimore, Boston, Brooklyn, New York, Philadelphia, and Washington, D.C. baseball club’s began entertaining the idea of a creating a professional soccer league. By the summer, plans for the ALPF were starting to fall into place, and the owners formally created the league on August 14, 1894. The league was doomed from the onset, as the owners failed to set a concrete schedule and sought to include their baseball players and managers in the teams. Ultimately, the scheme was little more than an attempt by the owners to maintain a stranglehold on the professional sports landscape and little effort was made to ensure the success of the professional league. In a mere six weeks, the ALPF ceased to exist, but that small window afforded many people in cities across the East Coast the chance to read about and see the greatest goalkeeper in the country. Shay was highly respected by the time the National League owners created the ALPF. The former Fall River Rovers goalkeeper was referred to as the “best goal tender in the country” in more than one publication prior to the cessation of the league. Shay’s ability and knowledge of the game were so highly respected that the owner of the Brooklyn Bridegrooms Baseball Club, Charles Byrne, made Shay the player/manager of the Brooklyn Football Club – Shay was the only individual with a background in the sport to be made manager of any of the ALPF clubs. Once signed by Byrne, Shay set about signing the best players from Fall River, including several men from the Rovers, namely Bernard Fagan. The Brooklyn side became a de facto Fall River team playing in the ALPF – several other players from the Spindle City latched on to the Boston club as well. Shay’s signings, coupled with his play in goal, earned the Brooklyn club the most wins in the doomed league with five. 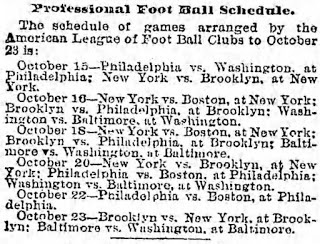 The club experienced a single loss, the league opener to Boston, during the six weeks that the ALPF existed. That loss gave the Baltimore team, a side made up of a number of British professionals who were a perfect 4-0 in ALPF play, reason enough to declare themselves champions of the ALPF. Shay and his men did not take kindly to Baltimore’s claims, and the Brooklyn club challenged the Charm City eleven to a six-game series to decide the true champions of the league and country. With Shay in goal, the Brooklyn men proved their superiority before the series dissolved as brusquely as the ALPF. It proved to be the swansong for Shay’s goalkeeping career. Following the demise of the ALPF, Shay abruptly retired from playing soccer at the age of twenty-four. Although the reasons for his retirement are unknown, his place as the first great American goalkeeper is certainly up for debate. The former Fall River Rovers man had accumulated a litany of awards and trophies by the time he signed with Brooklyn of the ALPF. According to The Brooklyn Eagle, who proclaimed Shay the best goalkeeper in the country, Shay had won eleven medals by the time he joined Brooklyn. That is an impressive haul for a man who played the game at its highest level for only six years. The fact that he was entrusted to run a professional club at such a young age undoubtedly shows that Shay was a well-respected figure within the game. After his retirement, Shay became involved in the liquor business, a career he would be involved in for the rest of his life. By 1896, Shay operated a saloon in Fall River with his brother, Timothy, called Shay Brothers. The bar remained in operation for a number of years, though it not clear how long Dennis was involved in the venture. That same year, Shay’s exploits as a goalkeeper made the news again, though it was not on the soccer field, rather Shay had taken up roller polo (roller hockey) and was minding the net for an amateur side in Fall River. He was said to be “showing up strongly.” Though retired from soccer, Shay, already the best soccer goalie in America, obviously still had the itch to compete. Eventually, Shay settled with his wife in New Bedford, Massachusetts. He appears to never have played a prominent role on the soccer field ever again, though he continued to be involved in sports. In 1906, he and two other men purchased the New Bedford Whalers Baseball Club of the minor league New England League. Shay’s involvement with the baseball club lasted just two years. From that point on, Shay does not appear to have figured prominently within sports in any aspect and spent the remainder of his life in New Bedford. He died in 1950. His exploits during his brief soccer career were so great that they were worthy of a mention in his obituary in The New York Times. Fall River would continue to produce soccer players and clubs of renowned quality throughout the early half of the 20th century. Many of the feats accomplished by the Rovers and Marksmen came to overshadow those of Shay and the original Fall River Rovers, but that does not mean that the first prominent American goalkeeper feats, and those of his club teams, are insignificant. The truth is quite the opposite. Even without any statistics, Shay’s feats as a goalkeeper were remarkable for the era he played in. After playing just six years at the highest level, Shay had accrued enough medals and plaudits to be considered by many at the time to be the greatest goalkeeper in the country. Regardless of the feats of other goalkeepers of the period, Shay’s fame alone, undoubtedly bolstered by his performances in Britain, cements him as the first great American goalkeeper and the patriarch of the celebrated American goalkeeping lineage. In a period dominated by baseball, Shay was able to garner enough attention outside of Fall River to be considered the best in the nation, and the fact that he did it in six years gives further credence to his ability in goal. The mention of his feats at the time of his death, over sixty years after Shay made headlines playing the game, only goes to prove that Shay, though forgotten by modern soccer fans, was indeed the first truly exceptional American goalkeeper. The next time you see Tim Howard play, or reminisce on the career of Kasey Keller, remember that Dennis Shay was the first significant goalkeeper in American soccer history and the first goalkeeper to test himself in the nation of the game’s birth. In writing this article, I relied on a number of primary and secondary sources and help from others. I could not have written this article without the help of Brian Bunk, the creator of the Soccer History USA Podcast, who was very generous with his time and aiding in tracking down several period newspaper articles. Ed Farnsworth, Chris Goodwin, and the reference librarians at The Fall River Public Library were also a huge help in giving their time and sharing source material. With the help of those stated above, I consulted the following sources: The Baltimore Sun, The Brooklyn Eagle, The Fall River Daily Herald, The Fall River Herald News, The Washington Post, Colin Jose’s article covering the 1891 Canadian-American tour of the UK, Ed Farnsworth’s post concerning Philadelphia’s ALPF History, Steven Holroyd’s History of the ALPF, www.baseballreference.com, the American Soccer History Archives, and several other secondary sources. A version of this article first appeared at Grant’s A Moment Of Brilliance blog on Feb. 12, 2016. Grant runs the A Moment of Brilliance soccer history blog. His work has also appeared at 8 by 8 magazine and and IBWM. Follow him on twitter at @Pieyow.